Racing continues at the Monmouth at the Meadowlands meet tonight with six turf races and 15% across the board takeout. 72 horses are entered and weather conditions are perfect. Relatively chalky results on the win end last night, but the “vulnerable favorite” race came back with a very healthy straight trifecta. IAN SMITH (race 5 #7), the horse in yesterday’s Handicapper Helper, was a play against based on a “PREP?” scenario. The replay is worth a watch; the horse had legit trouble and ran on very well through traffic late. It was a very useful prep, and he is a horse to follow out of that race. Race four tonight will have a very heavy favorite in the #1 FLY SWIFT (3-2). This is a tough horse to make a vulnerable favorite because she has things going in her favor: speed figure-wise she is the fastest, she was facing much tougher company, and she has run decently in both starts. There are a couple things in her OptixNotes from both starts that merit a pause, though. On debut, the note is PREP? STRETCH? - If unfamiliar with keywords, she needed the start and will move forward with more ground. She made her second start at Saratoga going 5.5f, did not stretch out (made her a play against that day), and she did have a very rough trip. The keywords were TROUBLE_START, TRAFFIC, TROUBLE, and SCARED. SCARED is a keyword used for horses that are timid. 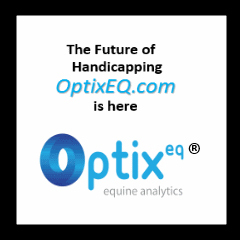 Her extended comment reads, “had legit trouble, steadied in the stretch, prior to that had the chance to split horses and did not want to.” Using the OptixNotes and her rail draw, there is a potential she could get intimidated again inside. As we have seen in sprint races this meet, horses on the lead continue to dominate. She has yet to show that dimension, and that's another reason that might make her vulnerable. There are scenarios where Dylan Davis sends her from the rail, she makes the lead, and the fastest horse wins the race. He could also potentially work a trip, though. Watching him ride on the NYRA Circuit, he is not known for his TACTICS+. Here are a couple other positive trip scenarios: there is a lot of speed to her outside, the jock is able to get her outside and never risk being intimidated, break well, sit patiently behind the duel and get first run, or save ground and have the rail open on turn and get a clear inside run, securing perfect trips. She is a risk leaving off all tickets, but maybe a horse that is not completely the “single” she looks on paper.